Every Tuesday I select one card and give you my interpretation of it. See how it applies to your life and ask, "What messages are here for you?" As I shuffled the cards to select this week's Intuitive Tuesday tarot card, I said, "Tell me what messages I need to bring to my readers this week." I selected the Knight of Coins from the Legacy of Divine Tarot by Ciro Marchetti. Knights typically indicate something that is about to happen, new people or experiences and an energy that change is in the air. It can also represent a young person who is a seeker, someone who is curious and interested in gaining knowledge...a student or apprentice. Coins (or Pentacles) have to do with material things, being resourceful, money and the business world. If the Knight of Coins represents a person in your life or traits that you possess, it may describe a person who is down-to-earth, possibly good with money, intelligent, responsible, diligent, honorable, helpful and good with his or her hands. This person (or you) is reliable, trustworthy and patient. If this represents a person other than yourself, a Knight probably represents someone who is your equal -- sibling, co-worker, etc. -- as opposed to a Queen, King or boss. 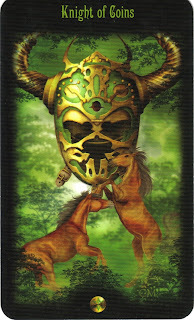 If the Knight of Coins refers to a situation, it indicates an area of your life where you are making tangible progress. Because of your diligence and responsibility level, this card may confirm that you are taking a sensible course of action. Your work is methodical, logical and practical. With the Knight of Coins, slow and steady wins the race. How does this relate to your every day life? If referring to a situation in your life, the Knight of Coins probably has message for you about your work, new employment, potentially property or finance issues. Because it is in its upright position, it indicates that you are on the right track, even if you don't yet know it or have proof. You are making slow and steady progress...so stay the course. The Knight of Coins...a personal example. Last week I wrote about one of my kids, Ryan, and his determination to stay in an honors math class. His level of determination and also what he's learning -- mathematics, Algebra, etc... are all symbolic of the Knight of Coins. The fact that this is a Knight and not a Page (which indicates more of a child), shows me that Ryan is growing up. This is just one area of his life where he is exhibiting more mature behavior. Thus he is represented by the Knight and not a Page...in this situation. As you read through this post, is the Knight of Coins a person in your life (if so, who? ), or does this card possibly represent traits that you posses or a situation you are experiencing? Use the energy of today's card to give you the determination and assurance you need to confirm you are on the right path and that you are making steady progress. To me, the Knight of Coins is a great confirmation that Ryan is well on his way towards success. We'll see if that success is evident in his math class...but regardless of his letter grade, he is learning and displaying great maturity. And for me, that is awesome! This is so right on for me at this time...including the wild stallions pawing at each other in the foreground. Our new Director resigned (after 4 months of being in over her head) and we are basically rudderless and Captain-less - making for utter chaos in an environment that requires a strong hand on the tiller. I am interpreting this card to represent the need for me to remain persistent, grounded and calm in the middle of the chaos. This: "Because it is in its upright position, it indicates that you are on the right track, even if you don't yet know it or have proof. You are making slow and steady progress...so stay the course." is exactly what I needed to hear today. This card definitely refers to a situation in my life. I've been feeling 'lighter' (not in a physical sense, LOL, but an emotional/spiritual sense), and am taking slow steps toward maintaining that feeling. :) So this was a happy card for me to see today. Thanks, Sheri!! This card captures a culmination of ideas and thoughts that I have had recently on where I am going, and where do I want to take my life. Afterall, it is up to me if I want things to be different. I've been honing in on some possibilities, and although I haven't yet put anything into motion just yet, I feel as though I am at least on the right track. I needed to get the same message that Quiet Dreams did. Hey, I'm going to meet her this week. Maybe we are each other's Knight of Coins? As a follow-up to my comment yesterday, I wanted to post that the Board of Directors announced an Interim Director - a strong and tough woman who is currently our bookkeeper. Whew! It is a relief! This fits me in a couple of ways but mostly the "tangible progress" part. I can also relate to you story with Ryan a bit. My son just got a part in the school play and is really excited about it. It seems to have inspired him in other aspects of his life as well! Perfect Moment Monday -- What A Hike! Perfect Moment Monday -- He's Growing Up! What's Taking Space In Your Life?